New from Amazon – the tablet ""
Amazon unveiled a new $50 tablet called ‘Fire’ last week and it’s exciting to see the features it can offer! Amazon already had a tablet released at $99 but the new one is bigger and better and almost half the price. When you buy a tablet that costs $300 or more, you are obligated to use it for everything and everywhere. 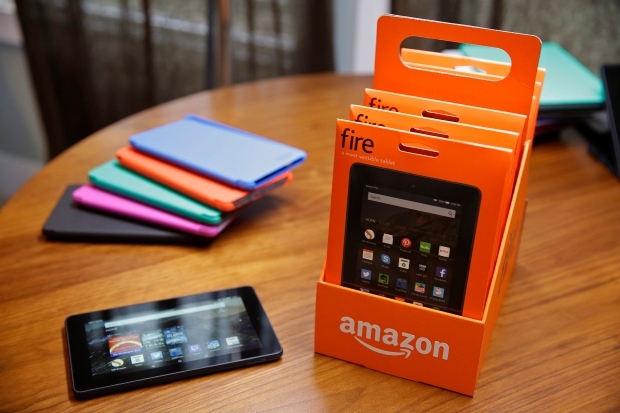 Perhaps, the biggest plus for this Fire tablet is that you can use it for specific tasks. For instance, station it in the kitchen to look-up, save and execute recipes or make your grocery list; you could use it just for music and hook up speakers in a special music station; you can use it like your regular e-reader and it is cheaper than a Kindle. At this price, Fire makes for a good gift too – priced less than $42 if you buy a pack of 6 tablets! Although the $50 tablet comes only with 8GB memory, Amazon has made it expandable! You can buy a 32GB micro-SD locally to expand the memory! Amazon has some mean goodies in the offering, including free apps, games, and tech-support within the device; you can even download Prime movies and TV shows to watch them offline. AND since it comes with a camera, you get unlimited storage on cloud to save your pictures and videos! The user interface resembles a regular Android tablet – swipe right and you’ll find all recently used apps! Some buyers who are particular about the screen resolution might not like Amazon’s Fire but it’s perfect for its 7-inch screen size! The downside could be the investment in Amazon’s Prime subscription. Who wouldn’t want it?